My love for Japanese trains has been slowly growing over the years. With such a sophisticated railway network one of the main things I’m looking forward to when I get to Japan is taking the train for the first time. I took the subway in New York when I was there in mid 2008 and I still have my metrocard as a keepsake. 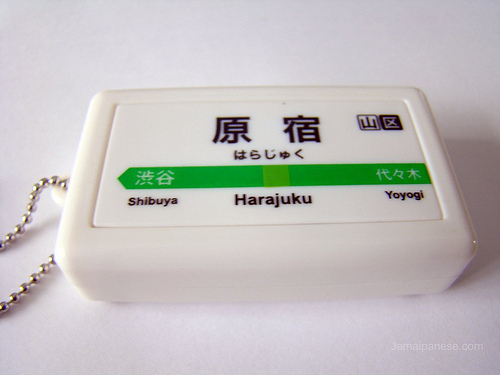 I’m imagining a train ride in Japan to be 10 times the fun and the Yamanote line is easily my favorite line. 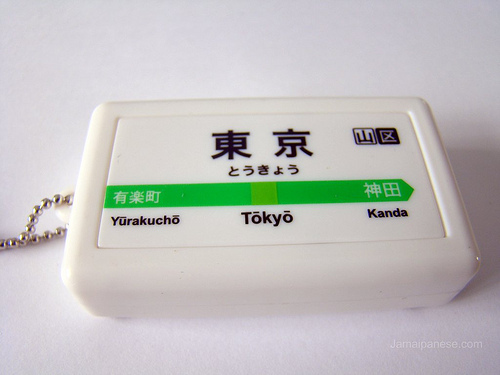 I was lucky enough to have a couple keychains mailed to me from Japan by a friend which play the departing melody for a couple stations on the Yamanote line when pressed. 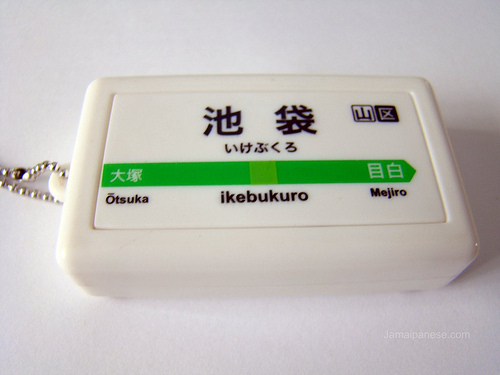 I got the melodies for 5 of the stations: Ikebukuro, Harajuku, Shibuya, Akihabara and of course Tokyo station. Pictures of each can be seen below as well as a recordings I made of each of the melodies for each station. Email and RSS readers please click here to listen to the melodies embedded below each picture and vote in the poll below. 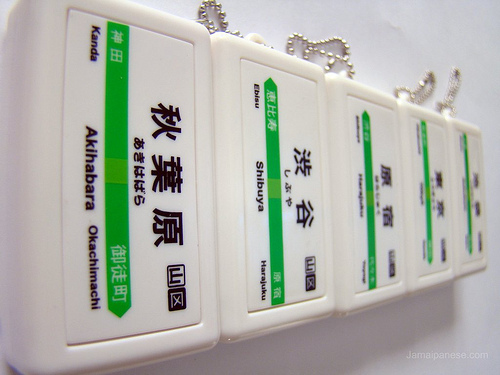 An extra benefit from acquiring these keychains is being able to recognize and learn the Kanji for some place names in Tokyo as not only the main station name are shown but also the adjoining stations as well! The hiragana reading also accompany them for easy reference and pronunciation help. …and the girliest of them all is? My girlfriend confiscated one of the keychains not long after they arrived, she wanted two but I threatened to send my panda poken to attack her if she took more than one. After explaining what each area was popular for can you guess which one she “borrowed” to keep her Nagi Nendoroid‘s company? Hint – of the five areas it’s the most girly of them all. Leave your answer in a comment below and if you can’t guess which one she took you can always just vote on the one whose melody sounds the best or has the better looking kanji. Which one of the keychains did my girlfriend choose? I bought the Akiba one, love it but it kept going off in my suitcase on the trip home! We picked up a couple of these at Yodobashi Camera in Akihabara; they’re pretty neat. I have the Tokyo station keychain. It sits on my desk and when I need to go to my “happy place,” I push the button and close my eyes and pretend I’m napping on the train. Works every time! 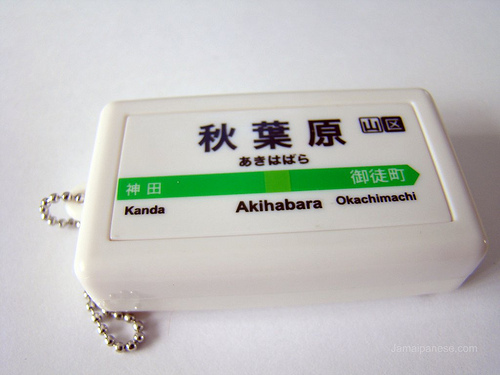 My oldest daughter has the Akihabara one. She also has a bath towel of the station sign. I have Tokyo station and my youngest daughter has the Harajuku towel. 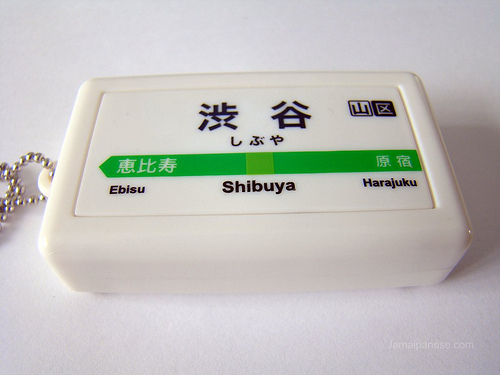 Those are the three stops we used most frequently on our trip, so they were nice mementos of our vacation. wow we think alike because I have the ikebukuro one right now beside me on my desk at work. When I want to tune out the occasional retard that annoys me at work i just “press the button” ^^. can’t wait to hear them like that, will have to resist the urge to do a somersault in my excitement. That’s really awesome that you’re already so familiar with the train lines as that’ll probably help you a lot when you go to Japan! Although, I have to say, even with no knowledge on my part I was still completely fine – that’s how easy and awesome the train system is. Haha. You probably know the melodies much better than I do, and I live here and ride the Yamanote every day. These are great. 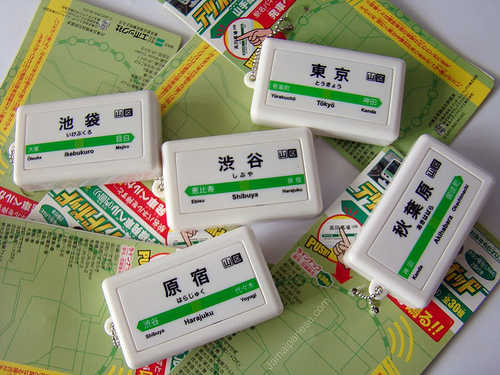 Offering up a free Yamanote jingle ringtone for anyone interested.